Please consider donating an item for the auction. Some items that seem to auction well are sporting event and cultural event tickets, airline tickets, timeshare accommodations, trips, hosted parties, restaurant gift cards, entertainment venue passes, baskets, and more. New for this year, Caesar’s Palace will feature upscale silent auction items. In addition, we are welcoming donations of premium liquor to offset the costs of our open bar. Please contact Louise McMinn for more ideas at supportcampogala@ondessonk.com. You can support our benefit by sponsoring our event. Each sponsorship level receives special advertising, recognition, and acknowledgment during the auction, and our Gala Sponsors and Patron Table Sponsors enjoy special seating and other benefits. 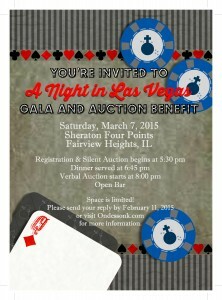 Please consider volunteering to help with the auction. There are opportunities to help before, during and after the event for as little time as you have available. Join us for fellowship with the Camp community! To volunteer, contact Louise McMinn at supportcampogala@ondessonk.com or at 618-210-7142.